Heat oven to 175C with a shelf in the middle. Spread almonds over a roasting tin or tray. Squeeze over the lemon juice, catching the pips in your hand. Mix to combine. If possible, give the nuts an hour to soak up the juice. Otherwise, just proceed. Sprinkle over the salts, sugar, pepper and chilli. Then drizzle generously with olive oil. Mix everything up well and spread the almonds out again. They should each be coated in salty oil. Roast for 10 minutes, mixing up the almonds after five minutes. Now mix in the rosemary, and roast for another 10 minutes, again mixing up the almonds half-way through. The almonds are ready when at least half of them are getting some colour. But be careful not to burn them. 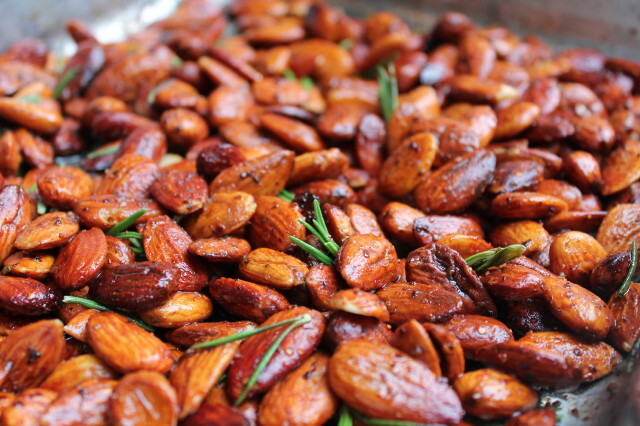 Let the almonds cool completely before serving or storing. They crisp up as they cool. They keep well in an airtight box for a week or so.